We value relationships. We work very hard to nurture them. And cherish the ones we have. iimjobs.com is one of our most valued clients. For years, they have entrusted us with their merchandise requirements. 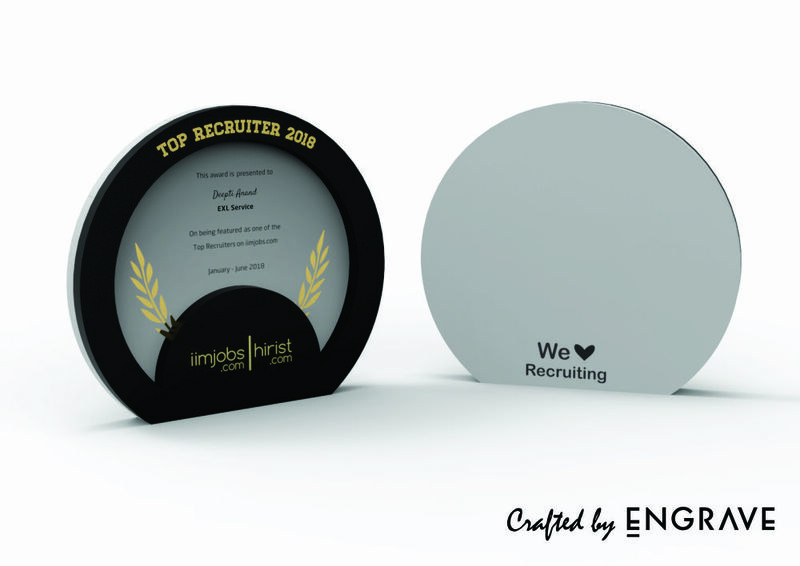 One of the things they ask us to do regularly is create the Top Recruiter Award. Every 6 months, we craft this memento for iimjobs.com & hirist.com . This they hand out to the top 0.5% recruiters on the site. It is one of the most important activities in their gifting calendar. What did we do for them this time? This time we used wood and acrylic. We made it look fluid and welcoming. Contemporary and elegant, too. The screen and digital printing ensured the design came alive flawlessly. And the information was printed aesthetically. Finally, we packaged it with the care such an award deserves. From concept to creation to delivery, we took care of it. The result of our handiwork is shown below. We invite you to take a look at it.